Written by bestselling author and early years expert Penny Tassoni, this is the only textbook for work-based learners endorsed by CACHE. Tassoni makes learning the key concepts on the job both easy and enjoyable. This book will support you through your assessment and the start of your career. 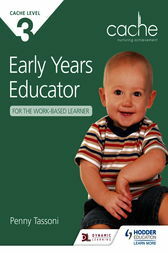 Penny Tassoni is a renowned early years author and expert.